When deciding to do the Christmas meal on the smokers during the summer of 2012, we wanted to do as much as we could on them. Boiling the veggies etc would be done inside on the hob as usual, but everything else had to be cooked on the BBQ. When it came to the potatoes, they had to be cooked in goose fat, plus the heat had to be high enough to make the potatoes sizzle! I decided to use the bottom section of the Pro Q with the water tray taken out. 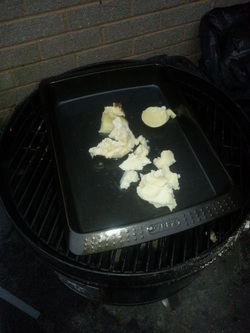 This was made easier as most of the food was already cooked, so out of the BBQ by now. 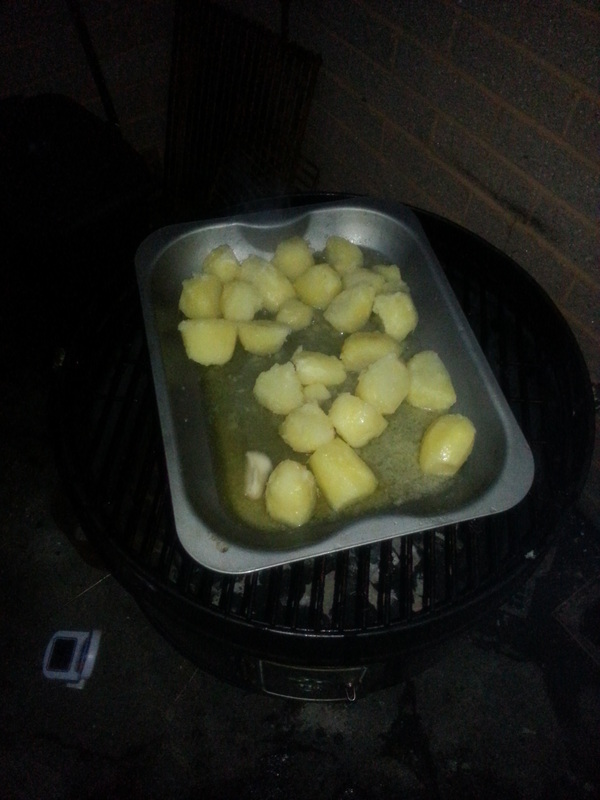 Once the lid had been closed, the fat had been heated directly over the charcoal., it was ready to add the pototoes. 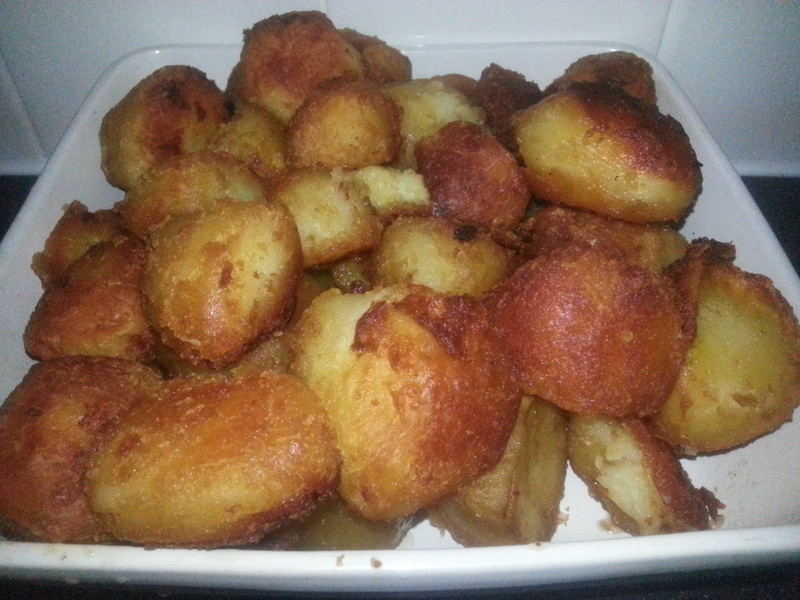 The potatoes, this time we used Maris Pipers, were peeled, cleaned and cut into decent sized pieces and then part boiled. Just before putting in the pan of fat, they were given a shake in the sauce pan to make them fluffy. Being CAREFUL due to the heat of the fat, we dropped the potatoes in, then we rolled them in the fat so they were fully coated, then replaced the lid of the ProQ. To add the mokey flavour, while cooking, we added some Wine Oak Chunks to the charcoal, to produce a subtle smoke flavour. Now, when you have a lot of people to feed, two ProQs and two deep roasting trays, it would be rude not to use them both wouldn't it? 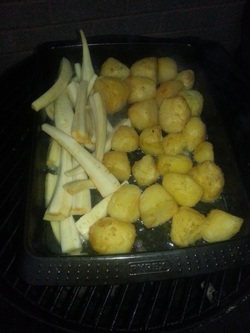 The second tray, about 15 minutes into the cooking, and we added some parsnips, peeled and sliced length ways. We returned to the smokers about every 10 minutes, turning the potatoes and parsnips until all were golden brown. After about an hour, these little beauties came out! Crunchy and golden on the outside, light and fluffy, with a subtle smokey flavour. I think these will be done a lot more often! !